Well, there is so much more to an engagement ring than what meets the eye. Since now the option for customisation is high, it also presents you with a lot more possibilities in design and styles - making it more important than ever to understand the anatomy of a ring. When choosing the right ring for your engagement, understanding the anatomy of an engagement ring will assist you in designing and picking a ring that is perfect for your partner, and something that they will cherish for a lifetime. 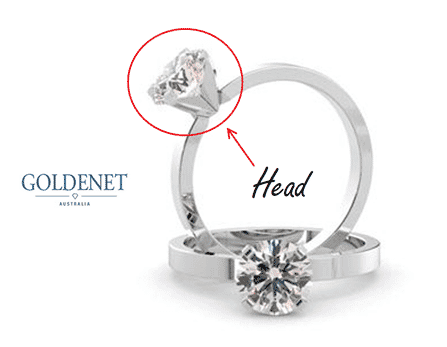 So here at GoldeNet, we have compiled an easy anatomy guide of an Engagement Ring. Let’s start with one of the most important parts of a ring. The head’s purpose is to feature the centre stone and secure it in place when it is on the finger. Then depending on the setting type (halo, solitaire, pave, three stone, etc. ), the head will be designed and hold the centre stone differently. In the image above, the setting type is a solitaire held secure by four prongs. 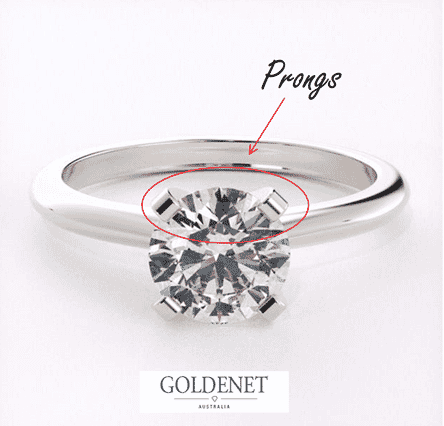 The prongs on the ring head are little metal claws that holds the centre diamond in place. They offer a timeless look with a traditional setting usually having 4 or 6 prongs (depending on the diamond shape and cuts). Prong type settings are clean, simple and its design allows for significant light pass through it, increasing the centre stone’s brilliance. Every element of the ring is to accentuate and maximise the brilliance and beauty of the centre diamond. Traditionally the centre stone is a diamond or any other type of gemstone. The image above features a solitaire wreath like design that purposefully showcases the centre diamond. The side stone’s purpose is to enhance the centre diamond’s beauty. The side stones allow for engagement ring designs to vary in different shapes, colour and sizes depending on the type of mount you choose. 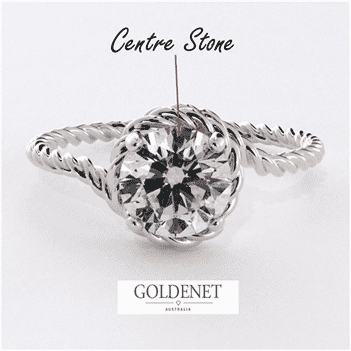 It usually sits close to the centre diamond ring to maximise the ring’s brilliance; however, side stones may distract from the centre stone and require more regular maintenance. Some ring heads settings with prongs may have gallery rails. Gallery rails are set midway above the shank and below the top of the centre diamond. They usually assist prongs in holding the centre diamond secure. Although this primarily serves as a functional feature, it also works to subtly accent the overall ring. Shoulders are the part of the ring where the diamond is set in. They usually rise towards the top of the ring adding to the overall aesthetics and style of the ring. 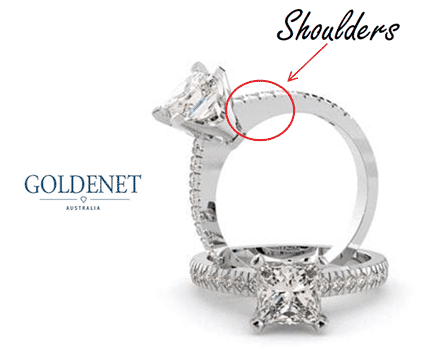 Depending on the design of the ring, the shoulders may differ in depth, width and come in a number of different shapes. The bridge of the ring is situated below the centre diamond connecting the setting and the metal. Bridges although a small detail and hard to see when on the finger adds an accented style to the ring. 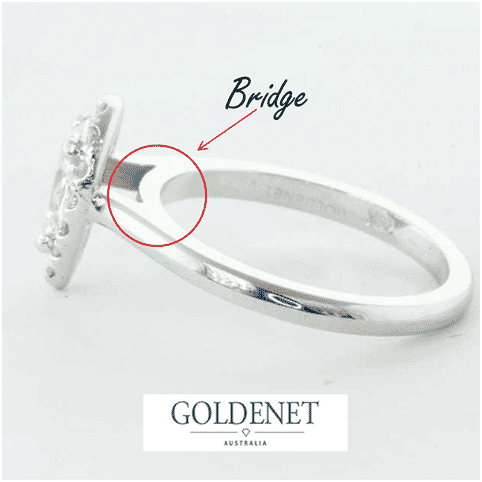 Traditional bridges usually feature subtle metal work whereas modern rings may feature a small stone. 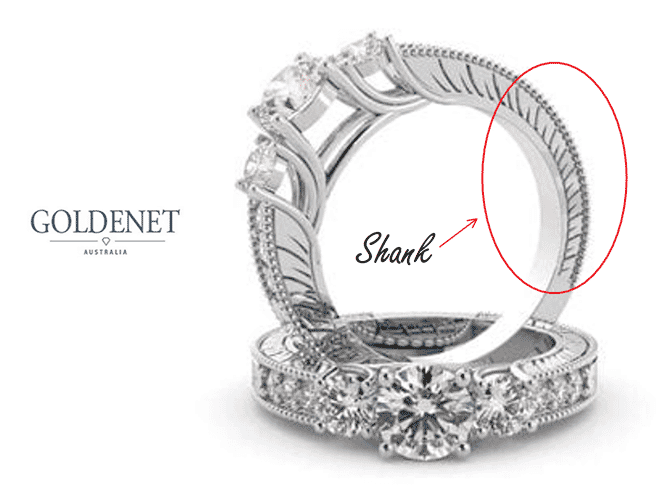 The shank is the part that brings all the components of an engagement ring together. It is band allowing for the ring to be worn on your finger. Bands can be in all different shapes and sizes, widths and designs. Common shank designs usually feature either solid metal or diamonds detailing along the sides. Rather than walking into your next engagement ring consultation, clueless about the terms that are used to describe certain parts of the ring, we hope that this has helped you more aware of the different parts and sections of a ring. This will surely come in useful when it comes to finding the engagement ring that you and your partner will fall in love with! 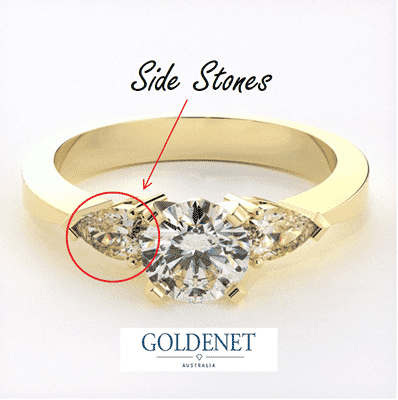 GoldeNet Australia are happy to pass on knowledge and expertise to help find the perfect ring for you - we can arrange a free consultation over the phone or face to face in our Brighton showroom. To organise this please click here.